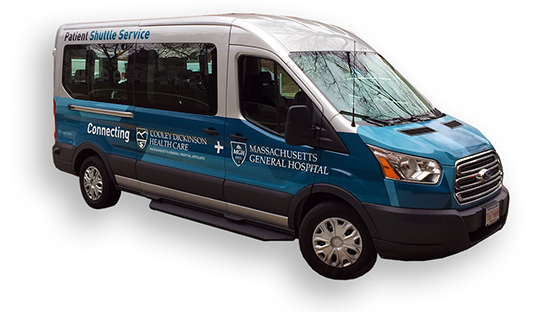 Our FREE shuttle gets you to Mass General and back. When you need to get to Massachusetts General Hospital and back, leave the driving and parking to us. Our shuttle service is free and open to existing patients of Cooley Dickinson/Mass General, with complimentary wifi and a regular schedule every weekday (except major holidays). So call to reserve your seat, and let us focus on the road so you can focus on your health. Mass General at 3 pm. There is no cost to ride the shuttle, but reservations are required. To make a reservation, call 888-554-4CDH (4234). Reservations should be made 24 hours in advance, with Monday morning reservations confirmed by the previous Friday. Please specify when making your reservation if you will require handicap-accessible transportation. The shuttle service program is a collaboration between Cooley Dickinson Health Care and the Massachusetts General Hospital.